The presidency and the National Assembly are at loggerheads over the Electoral Act Amendment Bill 2018 passed by both chambers of the National Assembly. Where is the ‘war’ headed and who blinks at last? These are the questions on the lips of Nigerians immediately the president communicated his decision to veto the bill. Throughout last week, the battle festered and right now, new dimensions are being introduced. Group Politics Editor, TAIWO ADISA, who has followed the developments, reports. as the election re-ordering bill, had caught the eyes of political actors and even political watchers since January when the House adopted the amendment to Section 25(1) of the Electoral Act 2010 to re-order the sequence of elections. Several commentators, including legal minds and political stakeholders, jumped into the fray as soon as the House of Representatives adopted the amendment to Section 25(1) of the Electoral Act. The legal advice read: “The president of the Federal Republic of Nigeria vetoed the 2018 Amendment of the Electoral Act of 2010 passed by the National Assembly in the exercise of his constitutional powers under Section 58(4oi) Constitution of the Federal Republic of Nigeria as amended following reasons. Each of the legal and constitutional reasons advanced by the president as a basis for the veto were examined in details below. “From the above amendment, it is crystal clear that the power to regulate the principal elements of all Federal Electoral process were expressed by the above amendment, removed from the Independent National Electoral Commission land vested in the Assembly (N.A) which has the power to make laws for peace, order and good government” of the Federal Republic of Nigeria and any part thereof. Furthermore, the phrases “organise, undertake & supervise” elections under section 15(a) of the 3” Schedule to the Constitution of the Federal Republic of Nigeria according to the President, allegedly infringed the discretion guaranteed” to lNEC by Section 25 of the of the Principal Act. “2.) The argument of the president that the sequencing of the elections under section 25 infringed the discretion of INEC without expressly pointing out what specific aspects or ways and manner cannot be a basis for legal or constitutional argument or decision. With due respect, the opinion expressed is too general to establish a basis for the exercise of a legal or constitutional power more so because “discretion” is a principle governed by the rules of Administrative Law and not that of Constitutional Law which the President claimed to have anchored his arguments. “3.) Thirdly the terms “organise, undertake and supervise” may have conferred a wide discretion on lNEC in matters of all logistics in the preparation and conduct of elections, the issue of discretion only comes to fore in the actual details of the preparation, organising and conducting elections. It is respectfully submitted that the sequencing of the elections in a Bill as to which was scheduled as first or last in the conduct does not in any way hamper or affect the discretion and capacity of INEC to organise, undertake and conduct these elections into various constitutional offices provided. “The new subsection (3) introduced into Section 138 of the Electoral Act, which the president argued repealed two crucial grounds upon which elections could be challenged is not entirely correct and the view could be misplaced for the following reason: “a. The new Subsection (3) to section 138 actually clarifies the ambiguity contained in subsection 1 of the Principal Act and reinforces the constitutional standards specified in Sections 65, 106, 131 and 177 of the Constitution of the Federal Republic of Nigeria 1999. In addition, it further provides that no person shall be qualified to contest elections in breach c any of the ‘Sections 66, 107, 137 or 182 of the Constitution of the Federal Republic of Nigeria as amended. “The amendment to Section 152 (3)-(5), which collectively imposed an obligation on the State independent Electoral Commissions to apply the standard of “free, fair and credible elections in the conduct of Local Government elections” is within the competence of the National Assembly to make laws in respect of the procedure regulating elections into the Local Government Councils in accordance with item 11 (Eleven) of the Concurrent Legislative List of the 1999 Constitution as amended. “What specific aspects or ways and manner cannot be a basis for legal or constitutional argument or decision? With due respect, the opinion expressed is too general to establish a basis for the exercise of a legal or constitutional power more so because “discretion” is a principle government by the rules of Administrative Law and not that of Constitutional Law which the President Claimed to have anchored his arguments. “It is, therefore, not entirely correct, with all due respect to Mr. President, to argue that the amendment may raise constitutional issues over the competence of the National Assembly to legislate on Local Government elections. The Supreme Court of Nigeria has decided on this issue in the famous case of Attorney General of Abia State & Ors v Attorney General of the Federation & Ors,” the legal advice read. Armed with the legal advice, the National Assembly appears set to override the Presidential veto, the second time in this Fourth Republic. In 2000, former President Olusegun Obasanjo suffered the first of such defeat when the National Assembly overturned his veto of the NDDC bill. The bill eventually became law. It was gathered that the leadership of the National Assembly have become emboldened that they were on the right path, following the interpretations by the legal minds in the legislature. The question now is whether the lawmakers can sail through with the plan. They would be guided in their action by Section 58 (4 & 5) of the 1999 Constitution, which provide the procedures by which the National Assembly may override the veto where a president withholds assent to a bill passed by both chambers. Section 58 (4) reads: “Where a bill is presented to the President for assent, he shall within thirty days thereof signify that he assents or that he withholds assent. At the weekend, at least four groups have emerged in the bid to stop the raging fire. The calculation, according to sources, is that if the bill sails though, the president would have lost huge moral and political face in the polity, something which could prove disastrous for his 2019 second term bid. If the lawmakers lose out, it is also being interpreted to mean a huge loss for the Senate President and the Speaker, Yakubu Dogara, who, sources said, would then be at the mercy of his governor, who it is believed, would readily corner Dogara’s seat for another member of the party. 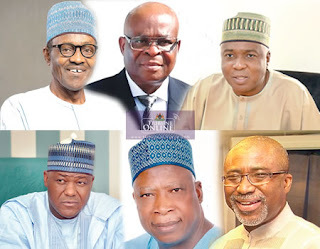 It was gathered that the game of numbers has been intense, with the Presidency’s coordinators said to be a minister from the South-South, a governor from the North-West and other governors and some senators. A North-Central senator was said to have offered his property outside the Federal Capital as a meeting venue. Besides the honorarium which sources said is being made available for attendance at the meetings, those who would stand against the bill from scaling the two-thirds huddle were also being promised return tickets to the Senate and the House of Representatives, sources said. It was also gathered that those opposed to the line of the ruling APC and the president were being told to forget 2019 return tickets to the chambers. It was learnt that the vote on the bill was being planned for next week until an injunction from a Federal High Court on Wednesday, which restrained the Assembly from going ahead with the bill. With the resolve of the Senate to write the Chief Justice of the Federation (CJN) and demand adherence to the principles of Separation of Powers, the lawmakers could get back to business as fast as they can. A source close to the ruling APC, described the situation thus: “Just like it happened in January, the bid to tackle the Senate and the House has been started. The move this time is to stall the two chambers from securing the two-thirds majority required for the National Assembly to override the veto. A minister is the arrowhead of the four groups that came together for this project. He is joined by two serving governors and some senators as well as some ministers on the fringes. For now, it appears there is no retreat and no surrender on the path of the lawmakers in the bid to override the president’s veto of the Electoral Act amendment bill, erroneously called order of elections bill. But the following week will be crucial to the whole show.